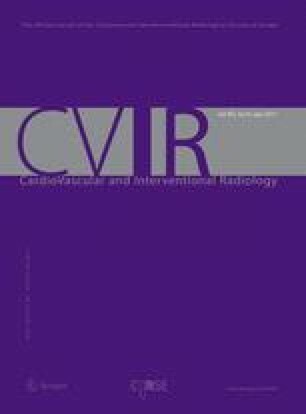 To compare the efficacy of an embolization agent with sclerosing properties (made of chitosan and sodium tetradecyl sulfate, CH–STS) with a similar embolization agent but without sclerosing properties (made of chitosan, CH) in treating endoleaks in a canine endovascular aneurysm repair model. Two chitosan-based radiopaque hydrogels were prepared, one with STS and one without STS. Their rheological, injectability, and embolizing properties were assessed in vitro; afterwards, their efficacy in occluding endoleaks was compared in a canine bilateral aneurysm model reproducing type I endoleaks (n = 9 each). The primary endpoint was endoleak persistence at 3 or 6 months, assessed on a CT scan and macroscopic examination. Secondary endpoints were the occurrence of stent-graft (SG) thrombosis, the evolution of the aneurysm mean diameter, as well as aneurysm healing and inflammation scores in pathology examinations. In vitro experiments showed that both products gelled rapidly and presented initial storage moduli greater than 800 Pa, which increased with time. Both gels were compatible with microcatheter injection and occlude flow up to physiological pressure in vitro. In a type I endoleak model, the injection of CH–STS sclerosing gel tended to reduce the risk of occurrence of endoleaks, compared to CH non-sclerosing agent (2/9 vs. 6/9, p = 0.069). No case of SG thrombosis was observed. Moderate inflammation was found around both gels, with a comparable intensity score in both CH and CH–STS groups (2.6 ± 0.9 and 2.7 ± 0.9, respectively; p = 0.789). Flow occlusion combined with chemical endothelial denudation appears promising for the treatment of endoleaks. This work has been presented at the following conferences: Zehtabi F, Fatimi A, Bertrand-Grenier A, Soulez G, Lerouge S. In vitro and in vivo evaluation of chitosan-sotradecol hydrogel, an embolizing sclerosing agent for the treatment of endoleaks. SFB 2015, April 2015, Charlotte, USA (poster). The online version of this article (doi: 10.1007/s00270-016-1557-1) contains supplementary material, which is available to authorized users. This work was supported by the Canadian Institutes of Health Research (PPP-106794) and the Canada Research Chair (S.L). Gilles Soulez is supported by a National Researcher Award from the Fonds de la Recherche en Santé du Quebec. The authors thank Dr. Philippe Roméo for his invaluable help and supervision during the histopathological analysis, Martin Ladouceur for statistical analysis, and Jocelyne Lavoie, Michel Gouin, Elias Assaad, and the animal care staff for their technical help during animal experiments. Fatemeh Zehtabi, Vincent Dumont-Mackay, Antony Bertrand-Grenier, and Hélène Héon have no commercial, proprietary, or financial interest in any products or companies described in this article (No potential conflict of interest). Ahmed Fatimi, Gilles Soulez, and Sophie Lerouge are co-inventors on a patent pertaining to chitosan–STS gel and have transferred their rights to their institutions. The technology has been exclusively licensed to Cook Medical. Currently, there is a research contract agreement in place between the academic institutions and Cook Medical to develop the technology. All surgeries and interventions were performed under general anesthesia according to the guidelines of the Canadian Council on Animal Care, and were approved by the institutional animal committee.